A Stories Alive session begins with an inmate request. Next, Stories Alive staff contacts the inmate's family and schedules a time for a session. In coordination with PPS officers, library staff then facilitates a very unique story hour. 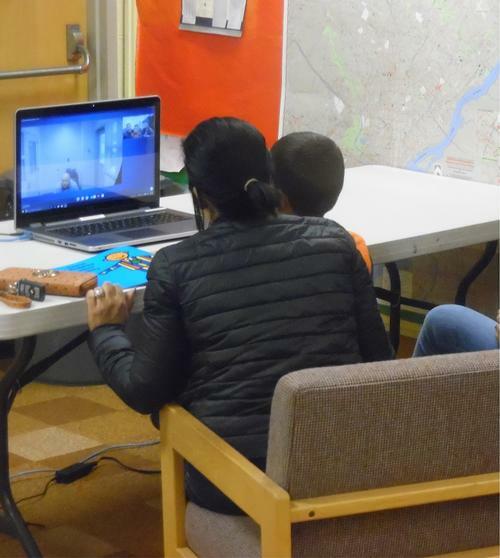 Children and their families come to either the Frankford, Kensington, or Widener neighborhood libraries, where staff has generously made conference rooms available. Children can relax in the peaceful atmosphere of the library and parents have a quiet room at PPS where they can focus completely on their children. Besides reading together, parents and kids have time to talk about anything from school to friends, future plans, and what the children want to be when they grow up. Each session begins with books and all the children, even the initially shy ones, open right up. Parents and children usually take turns reading to each other. Both the family and the parent have the same set of books, so each can see the book as they read together. A wide selection of books is available—some of our most popular titles include Giant Steps to Change the World by Spike Lee and Tonya Lewis Lee, Looking Like Me by Walter Dean Myers, and In Daddy’s Arms I Am Tall, a book of poetry by various authors. Many of the books focus on parent-child relationships and depict different kinds of people and families. When they leave, children take copies of some of the books they have read, both to encourage literacy and to reinforce their memories of the time spent with their parent. We also sign up the incarcerated parents and their family members for library cards if they do not already have them. The other parts of our Prison Services program are progressing successfully as well. The standing libraries we have established and stocked at Curran-Fromhold Correctional Facility (CFCF), Riverside Correctional Facility (RCF), and the Alternative and Special Detention Unit (ASDU) continue to be well patronized. Popular fiction and education- and career-oriented nonfiction materials circulate particularly well. Libraries are staffed by trained inmates and run with minimal Free Library supervision. We also continue to work to place Bridges, our wide-ranging resource guide for returning citizens, into as many hands as possible. We plan to refine and update our guide and release a new edition in 2017. Stories Alive has been made possible by a Sparks! Ignition Grant from the Institute of Museum and Library Services. We look forward to continuing our work with incarcerated parents, returning citizens, and their families. We hope to not only strengthen family bonds and literacy, but also to foster future engagement with the Free Library and the variety of services it offers. Hooray for You Guys - Wonderful Activity - Bringing Books and Loved Ones Together in a Circle of Peace, as well as Fostering Literacy - A Bright Piece of News in this Troubled World - May Your Program Flourish! This is a wonderful program....and it provides a nice alternative for families to stay connected and involved with one another! I got so excited when I saw this on your website. This is wonderful. I wish I could have had this for my son and his father after we went to court and he had to have supervised visitation. His father hated that he had to be "watched" and couldn't do whatever he wanted and go where ever he wanted with my son. This would have been a wonderful alternative. I applaud you for such a wonderful idea for parents and children to have a safe and creative way to build a relationship.